Over the last few years, employee workplace wearable technology programs have gained tremendous popularity. The addition of wearable tech is teaching employers that their greatest asset and investment is their team. Workplaces with employees who are healthy and happy typically result in more production, engagement and employees taking fewer sick days, leading to greater business success. Companies that integrate wearable technology into their workplace wellness program are actively trying to engage their employees in improving their wellbeing. ABI Research forecasts that enterprise wearables will surpass $60 billion in revenue in 2022. The driving force behind this booming industry is companies seeking to improve productivity. Employers are searching for solutions that provide tangible statistics about performance, in a secure and meaningful manner. However, many of these employers are primarily focused on ROI and struggling to connect their team to the benefits of a workplace wearable wellness program. Building the bridge between their wellness program, employee participation and engagement is their biggest challenge. The health and well-being of a company’s employees has a direct impact on the health of a business. Research shows that 21% of male employees and 32% of female employees who struggle with health and wellness also suffer from chronic disease. 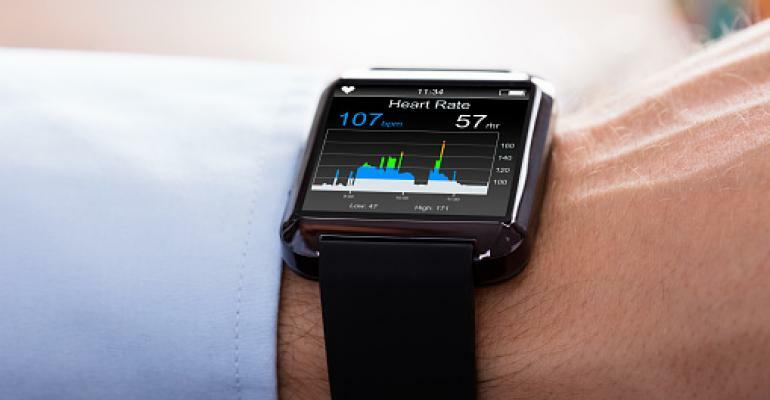 However, employees utilizing wearable technology are actively engaged in enhancing and improving their health. They find consistent and constant motivation to stay active and be healthy. In the past, employees have resisted using wearable technology because the technology has been viewed as heavy, cumbersome, intrusive and expensive, while requiring a lot of attention and charging. However, like most technology, wearable technology is constantly improving. Today’s wearables are getting smaller and smarter, and employees have shown that they are more willing to use wearable tech because they are simpler and less intrusive. Creating an effective workplace wellness program with wearables relies on engaging the entire workplace, while collecting substantial data. In the past, smart watches have been commonly used to count steps and measure distance. However, their inaccuracy caused by wrist motion and movement often makes them undesirable and ineffective. The progression of technology and wearables now allows people to do everything from count their steps to track movement and their risk of injury. For example, utilizing sensors within a dual layer memory foam insole, footwear insoles can generate performance data and step-by-step analysis in real-time to empower users to improve their daily walking and other fitness activities. This technology allows teams, employees and employers to engage and compete through an app on their smart phone. Beyond their ability to increase employee engagement and productivity, wearables in the workplace provide workers with the ability to immediately and effectively capture, share and collaborate on job sites, in real-time, without having to use their hands. Employers have experienced a positive ROI due to implementing workplace wearable programs. However, these benefits extend well beyond dollars and cents. Wearable-based wellness programs increase productivity, employee loyalty and time spent on the job. Effective wellness programs have shown that they reduce absenteeism while simultaneously promoting productivity, increasing the efficiency of employees from an economic perspective. On the other hand, unhealthy employees are more likely to disengage and are 43% more likely to have increased stress and anxiety. The gap between a poor and a successful wellness program can be bridged through discussion and encouraging well-being, self-care and healthfulness. Eighty percent of employees at companies with robust health and wellness programs feel engaged in their workplace and cared for by their employers, creating an environment that can nurture emotional health. Employers have an obligation to hire employees to improve safety and invest in their well-being and safety. Workplaces that invest in their employees’ wellness and health upfront through workplace wearable initiatives and programs reduce the likelihood of costly illness and injury. Instead of being reactive it pays for employers to be proactive with their workplace wellness programs. Before a problem can be solved it has to be identified. If your workplace has not started a conversation about workplace wellness then now is the time to open the discussion. Optimal health allows each of us to be personally successful. The same is true for a workplace. If we do not talk about increasing health and wellness in the workplace, then we are doing our company, team and ourselves a tremendous disservice. Engaging in an open discussion about work-life wellness might be what your company needs to pinpoint solutions that improve health, wellness and productivity for people through the entire workplace. Before you can implement any workplace wearable wellness program, it is vital to evaluate the current needs of your business and employees. If your company wants to positively impact productivity, morale and healthfulness, then it is time to develop, grow and build your wellness program. Once these decisions have been made you can make a plan for implementing a successful workplace wearable technology program. After a plan is set in motion, communicating the mutual benefits of the wearable tech wellness program to all employees is critical to the program’s success. Everyone must be on the same page to be able to accomplish the same goals. Communication leads to collaboration. When the entire team is engaged in the process, and feels safe contributing their individual ideas and experiences, it is easier to create an engaging and successful workplace wellness program. Workplace wellness wearable technology programs have the unique ability to simplify current wellness programs while simultaneously providing companies with tremendous data about their employees and workplace. Employees are already interested and willing to use technology to better themselves, their lives and their health. Bringing wearable technology into the workplace not only can create an engaging environment for the entire team and office but it can help maximize healthcare budgets, reduce safety hazards, and monitor health and wellness. When employers are committed to workplace wellness initiatives and put the needs, health and wellness of employees first, they create a workplace culture of care, productivity and engagement. Dr. Kevan Orvitz is a podiatrist and founder of MEGAComfort, a provider of ergonomic anti-fatigue insoles and orthotics.